After you deploy the components of Telemetry Dashboard and the telemetry agents have collected data, you can use Telemetry Dashboard to investigate stability issues for Office documents and Office solutions. You can also use Telemetry Dashboard to see the status of Office deployments. This article helps you navigate the worksheets in Telemetry Dashboard, use filters to adjust how data is displayed, and troubleshoot common error messages that are shown in Telemetry Dashboard. After the Telemetry Dashboard components are deployed, you are ready to start Telemetry Dashboard and connect to the telemetry database. To help you get started, view this short video called Quick tips for Telemetry Dashboard navigation . Although this video is for an earlier version of Office, the information also applies to newer versions of Office. From the Start menu, choose All Programs, then Micorosft Office 2016 Tools, then Telemetry Dashboard for Office 2016. On the Start screen, right-click the background or swipe in from the top or bottom to display the app bar, select All apps, and then select Telemetry Dashboard for Office 2016. Swipe in from the right edge to show the charms and then select Search to see all the apps that are installed on the computer. Next, choose Telemetry Dashboard for Office 2016. For Office 365 ProPlus and Office 2019, look for Telemetry Dashboard for Office under Microsoft Office Tools. On the Getting started worksheet, choose Connect to Database. In the Data connection settings dialog box, enter the name of the SQL Server server and database where telemetry data is stored, and then choose OK.
After you connect Telemetry Dashboard to the telemetry database, new worksheets are added to display information about Office documents, solutions, and other information. If you haven't yet deployed Telemetry Dashboard components, or if data isn't populating the dashboard as expected, see Deploy Telemetry Dashboard. After all components are deployed and you connect Telemetry Dashboard to the telemetry database, new worksheets are added to display telemetry information about documents, solutions, and other information. The navigation pane on the left side of the Telemetry Dashboard window is the primary way to navigate through the worksheets in the dashboard. You can also use the navigation pane to change the data range and label filters. This article includes a brief overview of the worksheets and how to use them in Learn about the Telemetry Dashboard worksheets. The rest of this article tells you how to adjust filters, how to determine overall Office stability, and how to investigate unstable documents and solutions. You can dig deeper by reading Telemetry Dashboard worksheet reference which describes every worksheet in Telemetry Dashboard in detail. This is helpful if you want more information about the columns and data shown in a worksheet. Custom reporting and database schema reference for Telemetry Dashboard helps you create custom reports in Telemetry Dashboard using a PivotTable report. Custom reports can help you customize how telemetry data is displayed for different business purposes. For example, you can view all Warning errors for Excel in a certain business group, create a list of all solutions that use unregistered ActiveX controls, and more. The following table briefly describes the primary worksheets in Telemetry Dashboard. All Telemetry Dashboard worksheets. For more detailed information about the worksheets, see Telemetry Dashboard worksheet reference. Provides a quick view of the health of Office documents and solutions and a view of deployment trends. The links on this worksheet help you investigate Office compatibility and stability issues in your organization. Helps you investigate which Office documents are the most heavily used and identify documents that are experiencing issues. This worksheet shows Office documents that were detected in the Most Recently Used (MRU) files in the local registry of monitored clients that run Office and earlier supported versions of Office. The list also contains load events for monitored clients that run Office. Select any of the value links to open a worksheet that provides more detail. For example, in the Total Users column, you can select any number to view the users who have that file in their MRU list. Shows details about solutions, such as COM add-ins, that were detected on monitored computers. This worksheet also shows telemetry data about load events on monitored client computers that run Office. Check the Critical column for a count of the number of unique users who have hit critical errors that the solutions are causing on Office clients. By reviewing critical errors and the number of users affected, you can decide whether to forcibly block add-ins that are crashing for many users. To do so, choose the Add-in management mode link at the top of the worksheet. You can also investigate performance issues that might be causing a solution to take a longer time to load than expected on some computers. The load time values that are displayed in this worksheet are statistical averages. 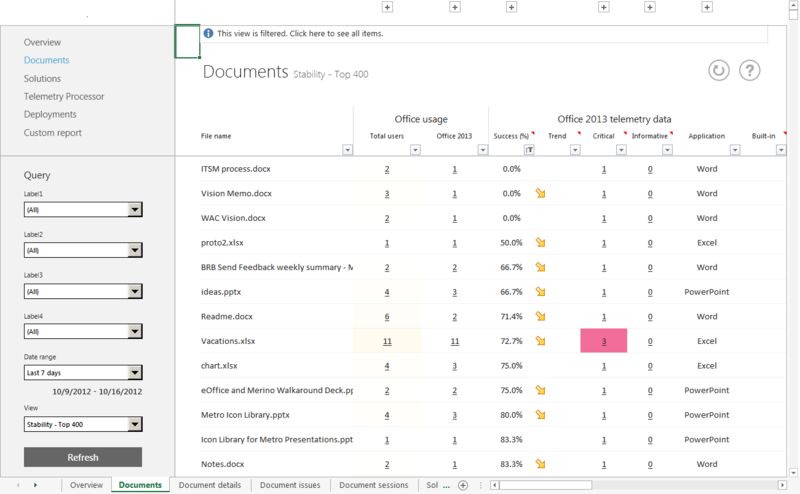 Select on of the value links to see individual user load times for a particular document. Lists the servers that run a telemetry processor, the number of users and computers that are monitored, and the date and time of the last update. Lists the versions of Office that are detected and other details, such as architecture type and number of unique instances of each version. Helps you to create a PivotTable report so that you can customize how you view the data in Telemetry Dashboard. Create a custom report if the Documents and Solutions worksheets don't display data in the way that you want to view it. To learn more, see Custom reporting and database schema reference for Telemetry Dashboard. Provides step-by-step guidance to deploy Telemetry Dashboard components. Provides a brief tutorial on Telemetry Dashboard concepts. In the navigation pane on the left side of the dashboard, there are filters called Label1, Label2, Label3, Label4, Date range, and View. You can use these filters to change the scope of the data that is shown in a worksheet. Any time that you change a filter, you must select the Refresh button to refresh the data in the content pane. The Refresh button is located in the upper-right corner of most worksheets. When you refresh the data, the sorting order is automatically reset. You can verify when the content pane was last updated by referring to the time stamp that is located below the Refresh button on the navigation pane. Use the Label filters to filter data by department, location, or deployment group. These filters are available for most worksheets. The Label filters are populated by data that is specified in the fields when you deploy the agent on client computers. For more information on how to set these fields, see Telemetry agent. Use the Date range filter to choose the date range for the telemetry data that you want to view. This helps you watch trends over longer periods of time, or drill down and find more recent data for analysis. The graphs on the Overview worksheet, such as Documents and Solutions stability and Office deployment trend, show data that extends back to four times the selected date range in the navigation pane. This provides better context when you graphically display the data and trends for analysis. For longer date ranges, there might be a small delay before the results are displayed in the content pane. The Overview worksheet supports changing the date range to Last 7 days, Last 1 month, or Last 3 months. A snapshot of the telemetry database is taken every evening at midnight (local server time). It is used to compose the graphs and data that are shown on the Overview worksheet. Therefore, the Overview worksheet isn't real-time, but is, instead, based on nightly snapshots. Frequently used displays all documents or solutions that were used within the selected date range, sorted by total number of users. Frequently used by Office 2016 and later displays all documents or solutions that were used by Office within the selected range, sorted by total number of users of Office. Attention items displays all documents or solutions that have critical issues that were found within the selected date range. Stability - Top 400/100 displays the documents (up to 400) or solutions (up to 100) that have success rates that are less than the target threshold (95% for documents, 99.9% for solutions). The Overview worksheet allows you to quickly understand how your critical documents and solutions (add-ins) are behaving on users' computers. Instead of browsing the Documents and Solutions worksheets, which show you item-by-item status, you can open and refresh the Overview worksheet to see a high-level view of document and solution stability. The following screen shot shows the Overview worksheet. The four numbers that are highlighted at the top of the content pane show the number of stable and unstable documents and solutions. If you see a high unstable count, you should investigate to find out what is occurring. If a document or solution meets these thresholds, they are considered stable. If they don't meet these thresholds, they are considered unstable. The success rate is determined by the percentage of sessions where the document or solution operated without encountering a critical issue. The critical issues that are tracked by Office Telemetry include application crashes, Office object model calls that would definitively fail for compatibility reasons, and more. A session is defined by the opening of a document or solution or an elapsed 24-hour period where the document is open. You can use the filters in the navigation pane to focus on specific business groups in your organization or customized date ranges. For example, you might want to know how well the new Sales reporting solutions for Office are performing since their deployment last month. You can select the Last 1 month date range, and the appropriate Label for the Sales team's computers. After you select Refresh, the Overview worksheet view shows you a high-level view of document and solution stability for the Sales team's Office deployments. From there, you can decide your next steps. In addition, the Overview worksheet view provides a summary of the top 400 frequently used documents and the top 100 frequently used solutions. Research indicates that these numbers represent the average number of documents and solutions in any given enterprise department that are frequently used. Built-in documents and solutions that are provided by Microsoft aren't included in the top documents and solutions counts that are displayed on the Overview worksheet. After you know the number of unstable documents and solutions, you can drill into the details. On the Overview worksheet, select a value to see a detailed list of stable or unstable documents or solutions. The following graphic shows how to view the unstable documents by selecting the corresponding value ( 23) on the Overview worksheet. After you click the link for unstable documents, the Documents worksheet appears. The worksheet is filtered to show the 23 unstable documents. The following screen shot shows an example of this filtered view. Although it isn't obvious in the screen shot, only 23 documents are listed, sorted by most unstable. Remember that when you select a link on the Overview worksheet to see details about documents or solutions, the contents pane displays a filtered view. Select the message bar at the top of the header pane to see the full list of all items for that worksheet. Back on the Overview worksheet, under the stable and unstable counts, you can see the trend charts that show how these counts increased or decreased over past periods. If you see the trend line pointing down to indicate a decline in stability, this indicates that recent changes are triggering issues for your documents and solutions. As shown in the following screen shot, the date range that is displayed in the trend chart shows an expanded range that is four times longer than the selected date range. This provides better context to view the overall trend data. You can track your overall Office deployment progress by looking at the chart at the lower part of the Overview worksheet. This shows the number of users who are running each Office version and how the Office deployments have changed over time. By using this chart, you can quickly check the deployment status and share progress with your stakeholders. The date range that is displayed in the deployment trend chart shows an expanded range that is four times longer than the selected date range. This provides better context to view the overall trend data. 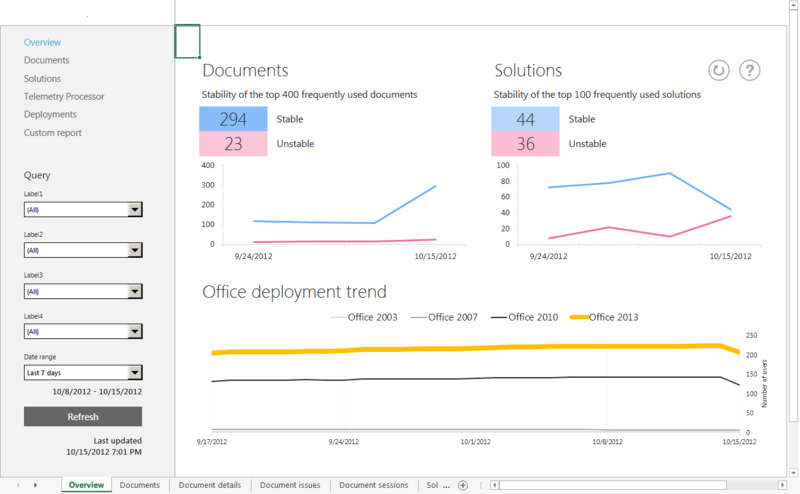 The following image shows an example of the Office deployment trend chart on the Overview worksheet. As you use Telemetry Dashboard, you might notice error messages that are shown in yellow banners at the top of the dashboard. The following sections describe common error messages. You see the error message "The Telemetry Dashboard COM add-in is not enabled or installed." To resolve this issue, enable the Telemetry Dashboard COM add-in that is available in Office 365 ProPlus, Office Professional Plus 2019, Office Professional Plus 2016, and Office Standard 2016. Start Telemetry Dashboard by choosing Telemetry Dashboard for Office 2016 in the All Apps page in Windows 8, or by choosing Telemetry Dashboard for Office 2016 from the Start menu under Microsoft Office 2016 Tools in Windows 10 or Windows 7. For Office 365 ProPlus and Office 2019, look for Telemetry Dashboard for Office under Microsoft Office Tools. Select the Let's get started button. In the Getting Started worksheet, select the Click here to use saved copies of Telemetry Dashboard banner that is shown in the following screen shot. Reopen the Telemetry Dashboard Excel worksheet that had the error message. You see the error message "Telemetry Processor service(s) have errors." The Telemetry Processor error message is displayed when no agents have reported any data to the dashboard, or if the Telemetry Processor hasn't inserted any data to the database for a day. For more information, see the log file (%windows%\ServiceProfiles\NetworkService\AppData\Local\Temp\dperrorlog.txt on the computer where Telemetry Processor is running). Verify the network connection between the telemetry processor and the Telemetry Dashboard is working as expected. In Service in Control Panel, verify that the Office Telemetry Processor service is running. Verify that the SQL Server server is running correctly. Verify that the data in the telemetry shared folder that was reported back from the agent was processed correctly. If there are many folders and files in the shared folder that weren't processed for more than 2 hours, the telemetry processor isn't working correctly. For more information about how to troubleshoot the telemetry processor, see Troubleshooting Telemetry Dashboard deployments.